Babblings of a Mommy: DIY: Trendy Neon Necklace. Yes, I'm still highly addicted to the neon trend - especially when it comes to jewelry! It looks so fresh and modern and really makes the simplest outfit pop. Last week, I was contemplating buying this baby from Zara, but never pulled the trigger. 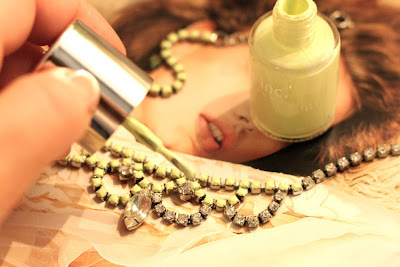 So imagine my surprise when I stumbled across a new style blog - A Girl, A Style and her DIY neon necklace tutorial! It's so simple and looks just like the one from Zara, if not better!! The best part? It doesn't cost a dime! 1. Rummage through your necklaces and find one that can use some updating. Make sure to lay it over paper before you start so you can catch any drips. Carefully paint each stone like you're giving yourself a manicure (2 coats is best). Wait 10 minutes, then finish off with a clear top coat, letting it dry overnight. This is so easy!! 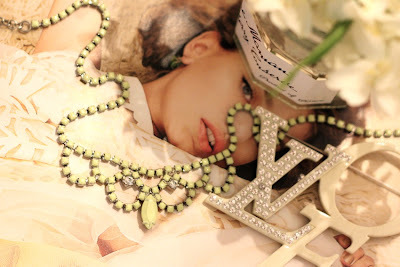 I'm definitely inspired to try this on one of my necklaces, how about you? Stopping by from Monday Mingle. I just posted a similar necklace on pinterest this week! Love the one you found. Have a fashionable week! Fab idea. I particularly like THAT necklace. This is coooool. I have so many tacky rhinestone pieces from various weddings and whatnot. Perfect way to update them! Omg this is such a unique idea!! How genius are you? Love it!